Renaissance Men performs at the Old Red Lion on the 25th & 26th November, at 7:30pm, in a special sharing, in preparation for tour dates in Spring 2019. Additional 2018 performances and casting will be announced soon. In a squalid London flat, Irvine (bookish, but not musty), has been having the dreams again. Something happened at The Brass Cat. But Irvine doesn’t want to talk about that. Winston’s giving up drinking. Once he’s had his last beer for breakfast, last rum and coke for dinner – and wasn’t there a bottle of wine that needed finishing? And Quentin’s discovered a lost masterpiece in a charity shop in Streatham. All his dreams are about to come true. A bleak and bitter comedy by James Patrick and Bag of Beard, Renaissance Men takes a long hard look at toxic masculinity, the Millennial Generation’s love of nostalgia, and asks if we should really sell priceless lost artwork for booze money? Bag of Beard is delighted is partnered with charity Survivors UK. 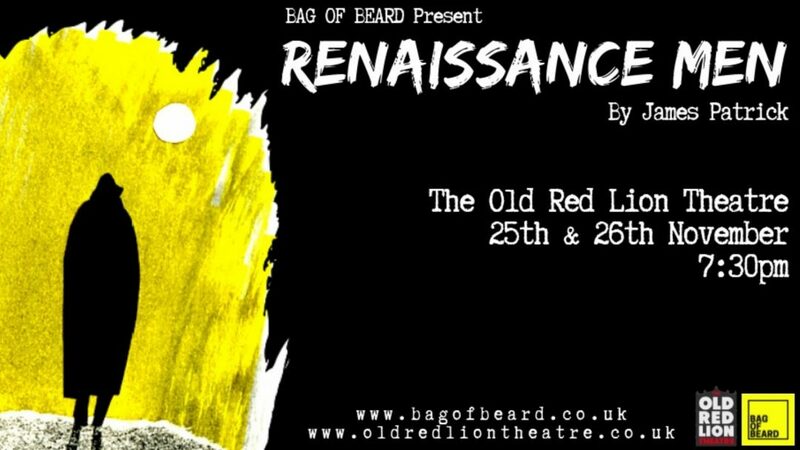 Renaissance Men is at The Old Red Lion 25th and 26th November 2018. Tickets on sale here.